Awhile back my sister brought me a batch of coffee beans fresh from Ethiopia. She’s doing medical mission work there, and on trips home is happy to support my passion for Ethiopian coffee. The coffee she brings me is green. I’ve tried different ways of roasting it. It’s possible to roast it in a popcorn popper (the air-pop style) but it tends to overheat and ruin the popper. You can do it on the stovetop, but it smokes the whole house. 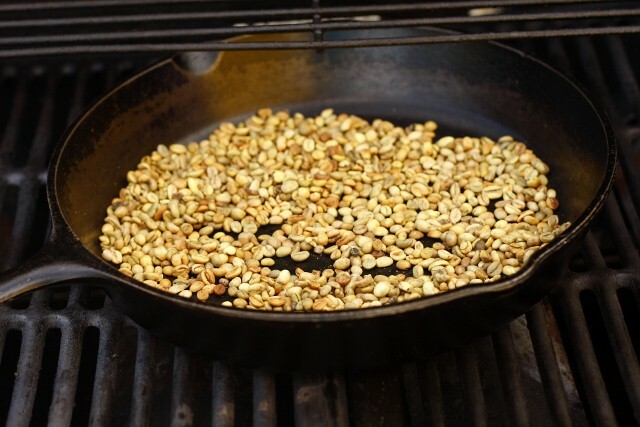 Most recently I’ve been roasting it on the barbecue grill, which works absolutely beautifully. Today I got some pictures of the process so I could better explain it to you. I started by turning all four of the burners of my barbecue grill on high and setting a 12-inch cast iron skillet in the center of the grill. The skillet should be well seasoned, but don’t put any fresh oil onto the pan– you’re cooking these beans in a dry pan. Shut the lid and let the barbecue and the skillet heat for a good 10 minutes. You want that skillet blazing hot. 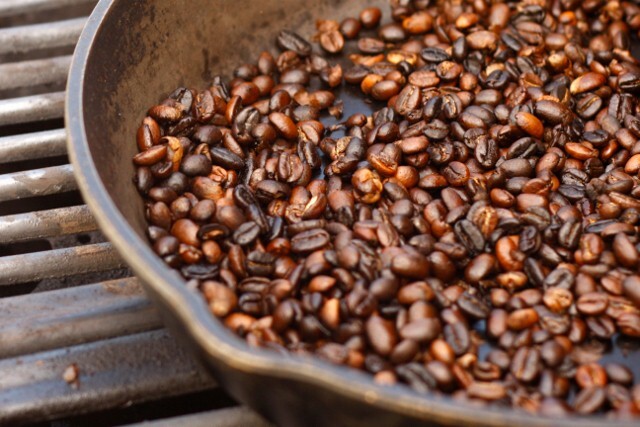 Once it has had time to preheat, pour a cup of coffee beans into the skillet and use a spatula to spread them out fairly evenly. Beans will cook fastest if they’re spread out in a thin layer all over the pan. As you can see, they literally are a pale grey-green at first. 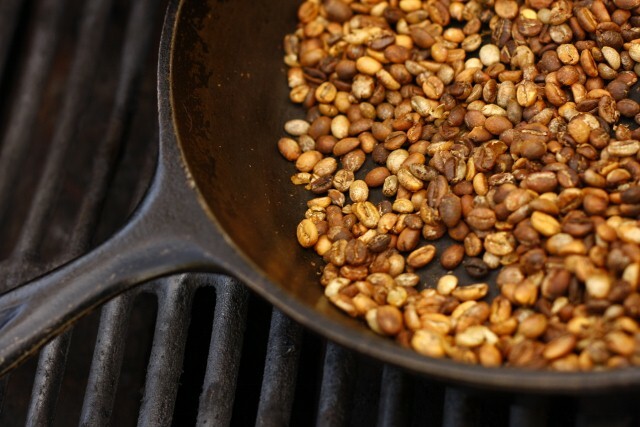 Once you’ve got the beans spread out in the skillet, shut the barbecue and let them cook for a five minutes undisturbed. If you’ve got a really hot barbecue, you may want to check and stir them a few minutes sooner than that, especially if you hear them starting to ‘crack’. Here’s how mine looked after five minutes– some turning light brown, and some yellow, similar to the color of corn nuts. Give them a stir and cook covered for a couple more minutes. Between 5 and 7 minutes you will probably start to hear them cracking and popping. You may also notice chaff coming off the beans and floating around a bit when you open the lid to stir the beans. Here’s where my beans started to crack and release chaff. A couple minutes later my beans were cracking briskly and beginning to deepen in color. Here they are after ten minutes, coloring up nicely. Continue to stir the beans every couple minutes, closing the barbecue between stirrings. Around 10-12 minutes you will probably begin to see streaks of oil in the pan as you stir. That means the coffee beans are beginning to release their oil. Soon after that point you will also notice smoke coming off the beans. 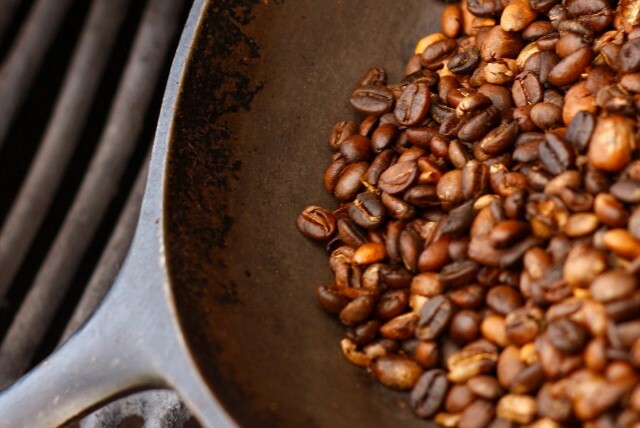 Don’t panic — that’s a normal part of the coffee roasting process. 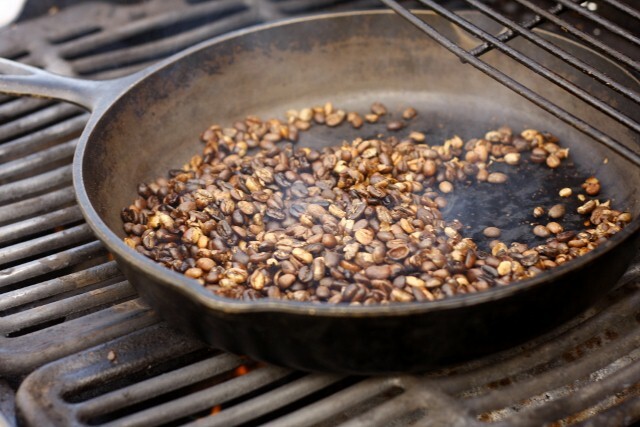 Once the beans are smoking, leave the barbecue open and stir every minute or two. You’ll see the beans begin to gleam as they release more and more oil. When they’re gleaming, and most of the beans are dark brown, they’re just about done. My total cooking time for this batch was about 16 minutes. Depending on the power of your barbecue and how thick you layer your beans, your cooking time may be longer or shorter, but the beans will still go through the stages in the same way I’ve described: cracking, chaffing, releasing oil, beginning to smoke, darkening up. Once you’ve tried one batch, you’ll know what your barbecue does. There will always be a few beans that stubbornly resist darkening. (My Ethiopian daughter told me that her mom just threw those beans away.) You can let the beans cook a couple more minutes to darken more if you like. But there is a point beyond which you will be actually losing flavor, and only have charred hulls remaining. That makes coffee more bitter than I like. So here’s the stage at which I quit. Scoop the hot beans onto an aluminum cookie sheet to cool. The aluminum will help the heat dissipate more quickly and let the beans stop cooking. And there you have it– beautiful freshly roasted coffee beans, all ready to be ground for tomorrow morning’s coffee! Ah! 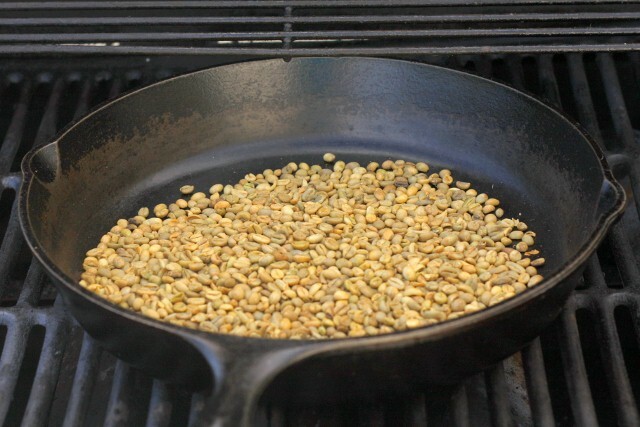 I just bought some green coffee beans last month and was planning to roast them on the grill… you just saved me the time and effort of trying to figure out exactly HOW that was going to work:) Thanks! We usually roast ours on the stove-but I really don’t like the smoke. It’s a calming thing for our daughter to roast the beans (something she helped with in Ethiopia), but we might need to try out the grill! Thanks for the tip. This looks like great fun for the family. Never seen or heard of green coffee beans. Here is an idea for when you get those beans ground up and want to make coffee. Try a coffee press; I purchased one at Walmart for under $20 for my daughter’s high school graduation gift along with an espresso machine purchased there, and have since given a press to a neighbor (who removed trees from front door so we could get out of our house after a tornado, back door had live power line over the steps, for two weddings attended this summer, and have purchased two for Christmas gifts this year. This handy little kitchen gadgets are used by majority of people in England because they fit very nicely into their tiny kitchens. The electric coffee maker is going on Labor Day garage sale, we love the press so much. I am so excited about this post! We’re going to Ethiopia in October for our court date, and i had planned on bringing back as much coffee as possible! 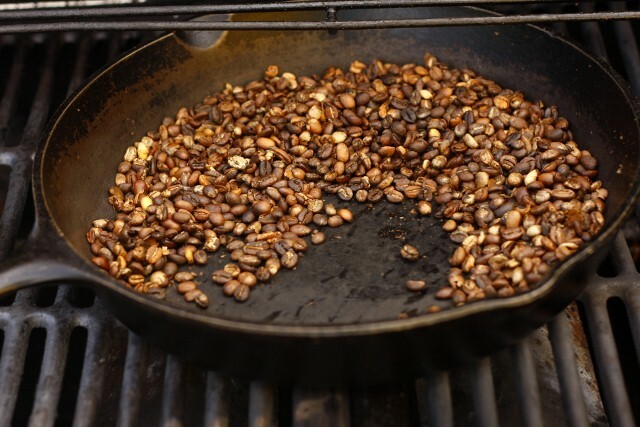 And now that i know how to roast them….so stinking excited!! I’ve looked and can’t find green coffee beans locally. I’ve wanted to try this for years! Any idea where I can look….besides the wonderful country of Ethopia? 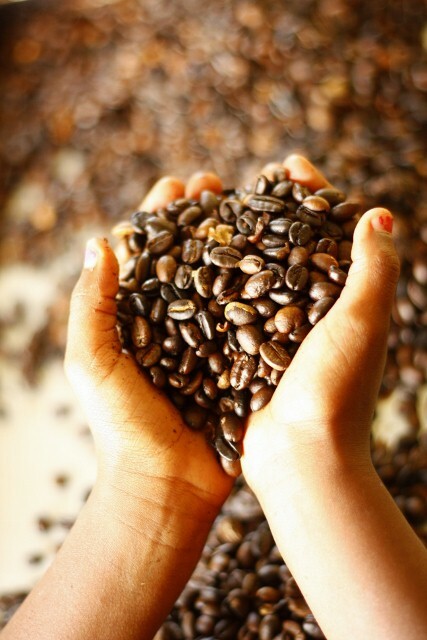 After hearing about this I went on Amazon and found a green coffee bean from a free trade in Ethiopia that I ordered. My girls love coffee so this will be fun. Mary or another writer may have another location for a better-tasting green bean. Would you like occasional email updates from me? Type your email address here to be added.